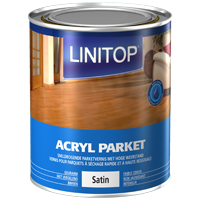 ACRYL PARKET - Water-based floor varnish Special "Normal to intense usage"
Water-based floor varnish special "Normal to intense usage”. Water based, single component polyurethane colourless floor varnish. 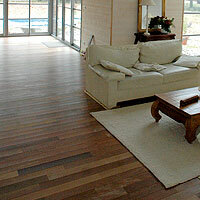 Protects indoor wood subject to abrasion while preserving its natural colour. Protects and waterproofs the wood. Enhances the woods natural beauty. High resistance to abrasion, scratches, water splashes and marks. Ideal for bathrooms. Withstands chemical products including ammoniated ones. Dries and hardens rapidly. Odourless. Non-slip. Easily washed. Does not yellow. Satin appearance. Can be coloured (consult us). Ecological formula of the latest generation: less than 5 % VOC. Parquet, stairs, floors, work surfaces, etc. Can be used on all wood types normally used for this type of structure. Good surface preparation is essential for the final appearance of the finish. Depending on the condition of the surface several sanding stages will be required: from grit 40 to 180. It is advisable to only use one grade at a time. Apply Acryl Parket in the direction of the wood grain. Do 3 criss-cross passes in one application by facing the light and starting at the part opposite the door so as to progress towards it. Start with the edges and then do the entire surface by working in zones of 2 metres by 2 metres. Do not open the windows during application to avoid drying too quickly. Apply a coat of Acryl Prim. After drying and without sanding, finish with two coats of Acryl Parket, sanding between these two coats. Do not cover the sealed surface with carpets or protective covers for 14 days after the application of the floor varnish. Light usage (with care): 24/48 h.
Application tools : Brush, microfibre roller.